"An aspiring blogger during the big year movement of the 2010s decides to write an entry detailing his point of view on an obsessed twitcher that he assists, and the birds they encounter over the day." For the record, I am that aspiring blogger and Jeremy Kimm the obsessed twitcher. I don't mean to detract from the importance of the movie... I just try to spice up my lead-ins. Today, I joined Jeremy K. on his big year quest with a tour of Metchosin and Sooke. We started our day in Metchosin by searching for flocks of gulls on golf courses and open fields. We encountered a couple decent gull flocks, but they were composed of the expected species. Taylor Rd. was bustling with activity due to what appears to be a relatively new feeder. The hedgerows there often host a good sparrow flock but it was much easier to view the birds due to the feeder being positioned in the middle of a lawn. At one point I thought I saw a hybrid White-crowned x Golden-crowned Sparrow but I lost track of it and couldn't find it again. The feeder had a flock of Red-winged and Brewer's Blackbirds, two Eurasian Collared-Doves, around 30+ Golden-crowned Sparrows, one White-crowned Sparrow, and 15+ Dark-eyed Juncos. Near Swanwick Rd., the flock of 30 or so Greater White-fronted Geese that has been around for over a month was still loafing about in the big field. We made our way to Sooke and made Whiffin Spit our first stop. We quickly spotted a group of Black Turnstones wheeling over the water, landing, and vanishing among barnacle covered rocks. 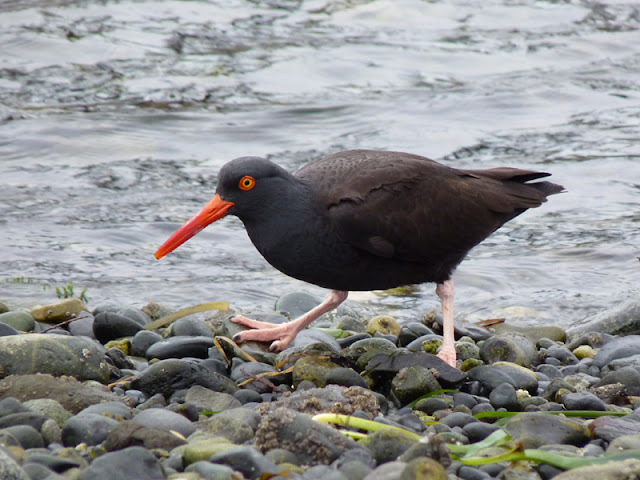 Closer on the shore, three Black Oystercatchers were feeding at the water's edge. There weren't any showstoppers at the spit, but a Red-throated Loon off the tip was nice to watch. 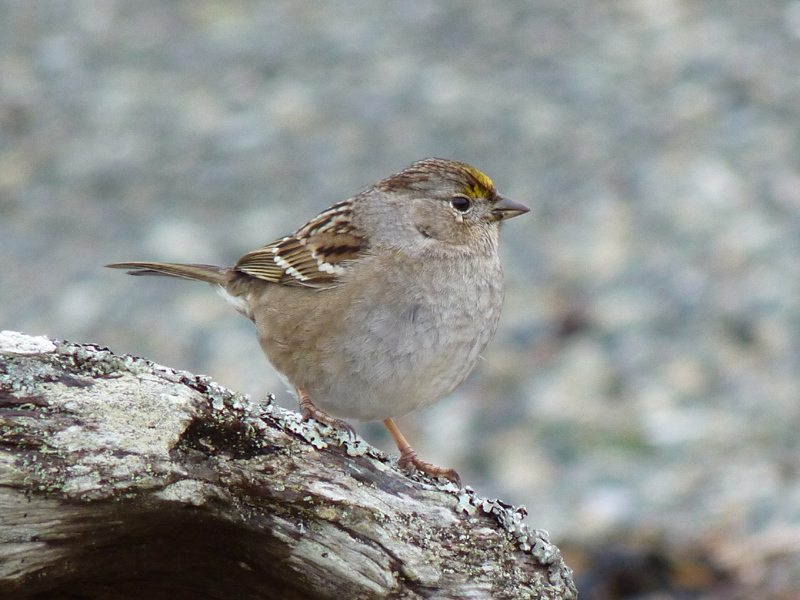 At the open section, a few Golden-crowned Sparrows were feeding around some logs and one sat still long enough to snap a couple photos. After Whiffin Spit, we decided to check a couple golf courses for geese and ducks. 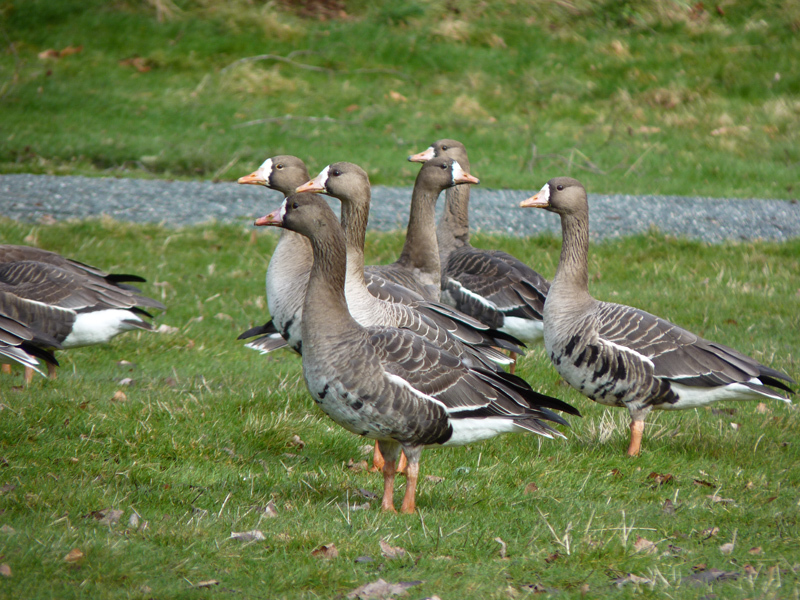 At the John Phillips Memorial Golf Course, we found a very confiding flock of 68 Greater White-fronted Geese. I made a slow and careful approach and made sure the group didn't flush, which allowed me to get a few decent shots. We decided to check the Demamiel Creek Golf Course but missed the turn off and ended up turning around up near Sunriver Estates. I hopped out at the entrance to a gated logging road for a pee break and was rewarded (not that I deserved a reward) with four Evening Grosbeaks passing over. 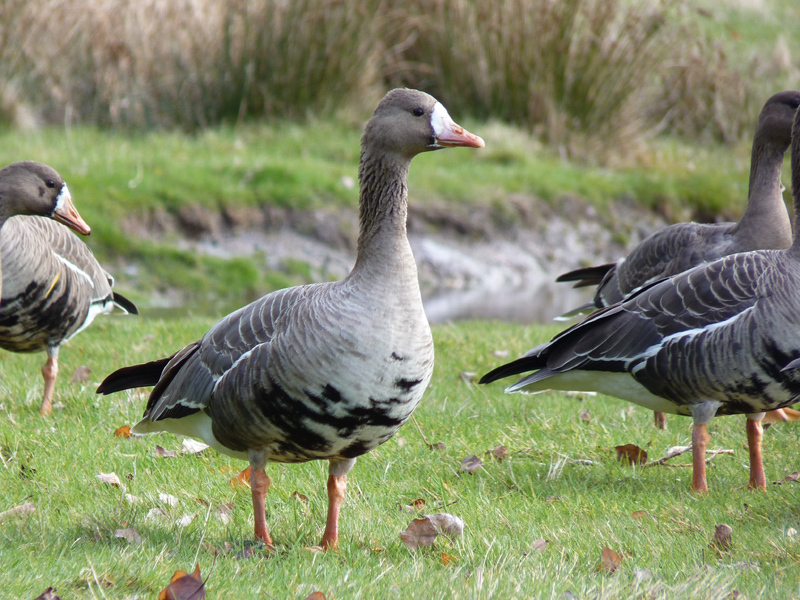 When we got to the golf course, we spied a nice flock of American Wigeons with a couple conspicuous male Eurasian Wigeons in with them near a small pond. We made another quick waterfront stop that gave a different view of Sooke Harbour but it was relatively uneventful. 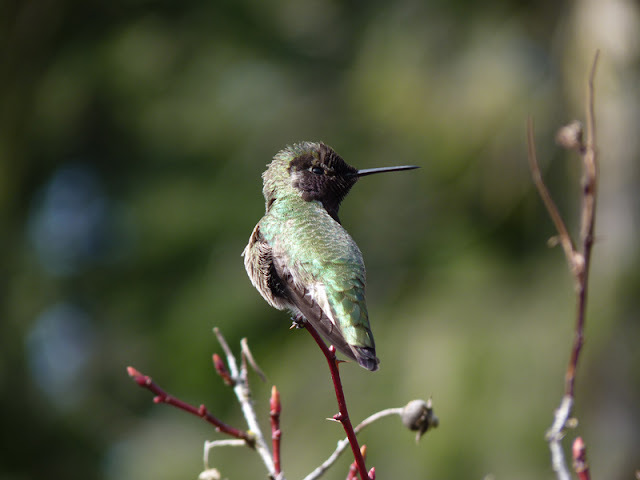 I did, however, get a decent shot of a male Anna's Hummingbird that seemed a little perturbed by our presence in his territory. We finished our day at the Goodrich Peninsula. We added some new birds for the day, including Green-winged Teal, Barrow's Goldeneye, and Gadwall but it was pretty quiet overall. 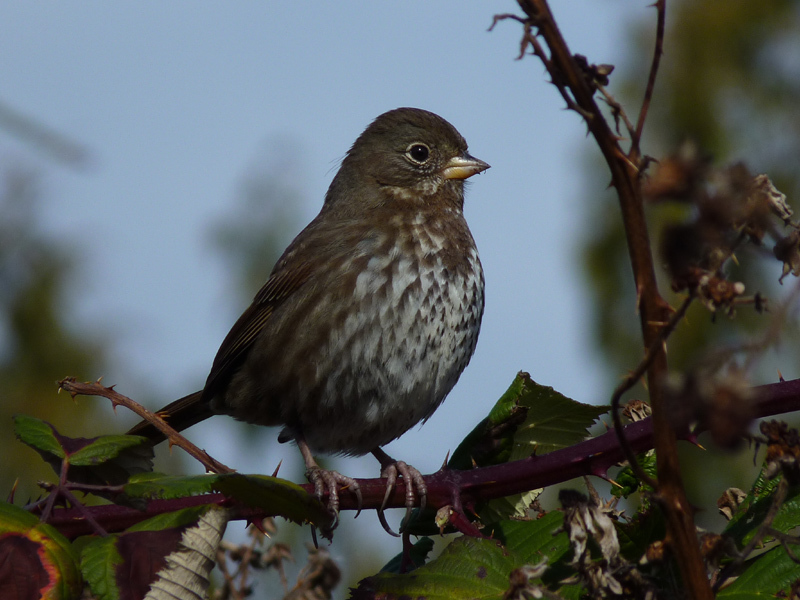 I managed a photo of one of the many Fox Sparrows we encountered in the blackberry brambles on the peninsula. Who knew Fox Sparrows had terrifying talons? Back at the base of the peninsula, we wandered onto the Sunny Shores RV Resort grounds and this is where I became "The Help". Jeremy K., bless his heart, has been having some issues catching up with Hutton's Vireo. Through the wind, I faintly heard what I thought sounded like a Hutton's. Jeremy K. has apparently lost the "zu-weep" tones because he didn't hear it. We wandered over to a patch of conifers in the direction of the call and the Hutton's started up again, confirming my suspicion. Then a second one started calling. Turns out Jeremy K. can hear them and he also got brief views of them, too. The vireo put him at 139 for the year. I'll need to dig him up some rarities if I want to maintain my status as "The Help". Terrific photos, Jeremy! Thx for sharing! Everything is so green down there,now. Still snow-covered here in the Trench but the Dippers and Pine Grosbeaks are singing! I'm glad you enjoyed the photos, Dianne. It is definitely pushing towards springs here - snowdrops have been in bloom for over a month here and crocuses are starting to flower. Salmonberry leaf buds are starting to open up, too. I have been hearing singing birds out here as well. Last week I was delighted by the sound of a Bewick's Wren singing outside my window. Enjoy those Pine Grosbeaks! That is one bird I wish was more common here on the coast.